The Luxor AVJ42 Series are excellent multipurpose AV / Utility Carts.24"W X 18"D X 24"-42"H Adjustable height from 24" to 42" in 2" increments. 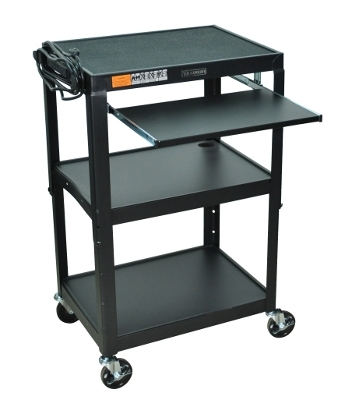 Shelves are 24"W x 18"D.
This AVJ42KB is Adjustable height cart with keyboard shelf. Keyboard Tray Measures: 18 3/4" x 11 3/4". The Cabinet model has reinforced locking doors with full length piano hinges and is made from 20 gauge steel with inner dimensions 17 1/2'D x 24"W x 16 5/8"H.Built to last with a lifetime warranty. Made in USA.